Capsule endoscopy is a way to record images of the digestive tract without the use of an endoscope. 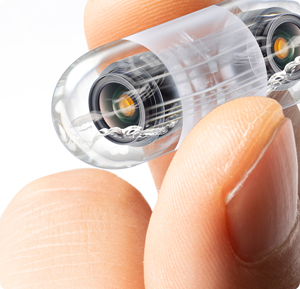 The capsule is small - comparable to the size of a vitamin- and contains a tiny camera. This device allows your physician to see the parts of your digestive tract that are not reachable in a colonoscopy or upper endoscopy, such as the small intestine. The capsule takes thousands of pictures that it transmits to the recorder for the physician to view. To allow for the clearest possible images to be taken, you should not eat or drink for at least 12 hours prior to taking the capsule. The day before your procedure you will be able to eat a light breakfast and lunch. At noon you will start a clear liquid diet. You will have to drink a small amount of laxative that afternoon to help clean the small bowel. The day of your procedure you will report to our office. You will swallow the capsule pill and be given a recorder to carry with you for eight hours. Two hours after ingesting the capsule you will be able to have full liquids, and in four hours you will be able to eat a light lunch. You will be able to leave the office with your recorder and resume your normal activities, although we recommend that you refrain from strenuous exercise. You will return to the office after eight hours to return the recorder. The capsule passes naturally in your stool in a day or two. The images from the recorder will be downloaded to a computer. Your GI doctor will view and interpret the images and discuss with you in a follow-up visit. Video capsule endoscopy is generally safe and well tolerated, but it should not be used if you are known to have intestinal obstructions or narrowing (strictures). To learn more about the PillCam procedure, call North Shore Gastroenterology at (440) 808-1212 schedule a consultation with one of our GI specialists in Westlake and Brooklyn, Ohio or you can request an appointment online.